“Snowden” opens today at Yelm Cinemas thru Oct. 6. Click here for showtimes and to purchase your tickets. Snowden-the movie, Official site, directed and co-written by Oliver Stone. By A. O. Scott, The New York Times. “The popular Harvest Festival for 2016 at the Yelm Farmers Market has been set for October 9th this year. The half-day schedule of fun activities will be held during the market time of 10 am to 3 pm at Nisqually Springs Farm, at 17835 SR 507. Similar to last year’s heavily attended event, the Harvest Festival will include pumpkin bowling, pumpkin painting (so children won’t need to carve for decorating), hot apple cider, face painting, and the ever-present photo-booth opportunity of the Yelm Farmers Market mural. This year, hay rides will not be available. There will be coffee sack races with prizes for children and adult categories as an additional activity (weather permitting),” quoting the Yelm Farmers Market. Open Sundays through Oct. 16, 2016, 10am-3pm. Read more from the Craigslist post. If former Mayor Harding had done his homework of candidate Stefan Chatwin, he would known about allegations of Chatwin’s mishandling city funds in Hayden, Idaho and other issues. In an embarrassing turn for Harding, Chatwin withdrew his name for consideration after being offered the job. With almost a year without a permanent administrator, Harding finally turned to his city council to approve hiring a professional talent recruitment firm, Prothman Company. After the interview process on September 8, one of three excellent Prothman Company candidates withdrew his name from consideration. Mr. Lincoln shared with me how the city should be using social media more to tell city hall’s story, rather than just the news through the local newspaper and blog. I agree and was thrilled to see Mayor Foster allowed the Police Dept. to have a Facebook page, immediately after Mayor Harding left, which has been long overdue. Harding had a clamp-down on any such communication with constituents, of which Mr. Lincoln was well aware. After JW Foster selected Evans for the post, she also withdrew her name from consideration. * Ms. Evans brought a wealth of understanding about what Yelm must do to diversify the city’s revenue stream, which she said must be the top priority [I agree!]. * She said Yelm needs to transform from a bedroom community into a place where people also can work in good-paying jobs. * Evans also noted Community Development needs an “Ombudsman” to be more receptive to the public. 5. Interim City Administrator Bill Brandon leaves September 30. Yelm’s contract with Prothman Company for Interim City Administrator Bill Brandon expires September 30. Brandon was originally supposed to be here for only a few months and has been here for over half a year. He has done a magnificent job in handling a unique set of issues, including the resignation of Mayor Harding and subsequent new management direction under Interim Mayor Foster. I applaud him for his outstanding contribution to our community during a difficult time. He has been a beacon of light guiding the city! Yelm’s City Administrator is an “at-will position,” meaning they can be terminated for almost any reason. I am certain many candidates look to this job and see Mayor Foster is an interim mayor for a year, then he may not choose to run again next year or there may be a new mayor elected, and that elected mayor may want to choose their own city administrator. That has to be a major deterrent to accepting this position, which the Prothman Company will have to address with the next round of candidates. As of Monday, October 3rd, the City of Yelm will return to the mayor performing two jobs: his own and as acting city administrator (without pay). The search for a permanent, full-time Yelm City Administrator continues! Shimon Peres is a hero of mine not because of his 7 decades as a leader in Israel, rather for the abrupt change and about-face he undertook in going from one of Israel’s leading hawks to being a Nobel Prize-winning Ambassador of Peace. In order to achieve such a stunning reversal of views, Prime Minister Peres developed an inner strength, courage, and wisdom to move into a state of humbleness to be a light-bearing champion of change, realizing that arrogance and bravado leads to war and does not serve his people. Only through humility can one do that. This understanding goes way beyond working for Jewish causes and the State of Israel, rather a visionary and true world humanitarian in an area of the world bereft of such leadership. 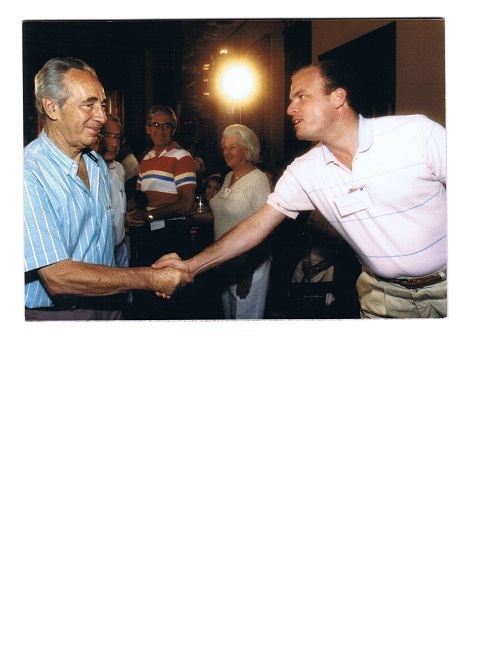 I was very fortunate to be the guest with a few members of my family on The Prime Minister’s Mission to Israel in summer 1988, an educational trip to exchange ideas, experiences, and viewpoints with Israelis from many diverse fields, along with tours of notable sites. After a day of break-out groups, I went up to Peres to shake his hand for his leadership in finding peaceful solutions in the Middle East. He won the Nobel Peace Prize not long after that in 1994, along with then-Prime Minister Yitzhak Rabin and PLO Chairman Yasser Arafat. The transformation of his views and a passion for world peace by Prime Minster Peres mirrors that of another one of my heroes the world lost earlier this year, Muhammad Ali. Their commitments in their changes of uplifting the world are truly testaments to a life well-lived! Click here for the Peres clips. “[President] Obama led tributes to the elder statesman as a friend who refused to give up on the dream of peace. Peres’ commitment to Israel’s security and pursuit of peace was “rooted in his own unshakeable moral foundation and unflagging optimism” the US leader said in a statement. Obama is to join world leaders including former US president Bill Clinton, French President Francois Hollande and German President Joachim Gauck and Britain’s Prince Charles in attending Peres’s Friday funeral at Jerusalem’s Mount Herzl, where many Israeli dignitaries are buried. Peres, who was 93, held nearly every major office in the country, serving twice as prime minister and also as president, a mostly ceremonial role, from 2007 to 2014,” quoting France’s AFP. With the resignation of Councilor Bob Isom leaving his former council seat vacant, the city of Yelm is now accepting applications from the public for city council. The interim council seat has one year remaining in this term, then is open to election in November 2017. RCW 42.12.070 Filling nonpartisan vacancies. 3. elector within the city limits. While a former city council candidate who previous lost their elections and served for a year as interim councilor may be at the top of the list to consider for appointment, along with a Planning Commissioner who lost their council election, I am elated to hear Mayor Foster is committed to more transparency in city government and wants to involve community members to be part of the governing process. To choose someone new to city government would bring a welcome change, diversity, and fresh insights. Day of Caring is the single largest day of volunteerism in Thurston County! We invite you to join us as we celebrate 24 years of Day of Caring in Thurston County, where volunteers come together to complete service projects for local agencies. To increase the opportunity for individuals and organizations to participate, Day of Caring is now two days: Friday, September 30 and Saturday, October 1. Help us make an impact in our community! Register here to volunteer as an individual. If you would like to register a team or project, please contact: Stacy Hicks, Volunteer Coordinator at (360) 943-2773 ext. 122 or shicks@unitedway-thurston.org. September 30 – Projects begin at 8 a.m. and end at 2:30 p.m.
* What can you do? Buy a counter-top water filter. * Yelm’s Survival Center an excellent source for water filters. “Drinking water supplies for two-thirds of Americans are contaminated with the carcinogenic chemical made notorious by the film “Erin Brockovich,” which was based on the real-life poisoning of tap water in a California desert town. But there are no national regulations for the compound – and the chemical industry is trying to keep it that way. Today [September 20, 2016] EWG released an analysis of more than 60,000 tap water tests conducted nationwide, finding that chromium-6, or hexavalent chromium, is in the tap water of more than 218 million Americans,” quoting Bill Walker, Vice President and Managing Editor and David Andrews, Senior Scientist, Environmental Working Group. All 7 water systems tested positive for chromium-6. 92 out of 104 samples tested positive for chromium-6. Click here for the 2015 City of Yelm Water Quality Report. “Recent news stories tell us a sobering truth: Not only are we facing rapid depletion of groundwater aquifers, much of the world’s water supplies are also becoming too contaminated to safely drink or use for cooking or bathing,” by Dr. Mercola. By Erin Brockovich, Tweeted September 20, 2016. “Drinking water for the city of Yelm met all standards for safety in 2015, according to a quality report released late last month,” quoting the Nisqually Valley News. Editor’s note: No mention of the Chromium 6 issue was in the newspaper’s report. increases Stem Cell growth, significantly reduces EDEMA and swelling, increases production of collagen, helps recover faster from strokes, heals swollen muscles and much more. Stop by for more information on how the chamber could benefit you. Epsom Salt, baking soda, salts from all over the world including your surveyed custom made essential oil, to soak in and detox and get nourished while enjoying a MASK from SEACRET filled with Dead Sea minerals that are known for their health and wellness benefits. promotes Vitamin D in our body & a nice tan after just 8 minutes. strengthens your immune system, detox and then cool yourself of in our Jacuzzi shower. soaks most toxins out of your body thru your feet. Aroma Touch, Sports, Classic, Swedish, Sound vibrational healing, Cranio Sacrale Therapy, Reiki and Foot reflexology. TELL BLUE LOTUS SPA YOU READ ABOUT THEM ON THE YELM COMMUNITY BLOG! * Trina Johnson will speak Monday @ Every Monday Yelm Networking Group. “We stock a focused selection of games and conduct product demos on most everything that we sell. This allows us to offer a more rewarding shopping and gaming experience to every one of our loyal patrons. A big “thanks” of appreciation goes to Phoenix Company Cards and Games LLC for offering their facility late into the nights as a Yelm area “cooling center” during the summer heats waves. Trina Johnson of Phoenix Company Cards and Games will be the guest speaker this Monday at the Every Monday Yelm Networking Group. TELL PHOENIX CARDS AND GAMES YOU READ ABOUT THEM ON THE YELM COMMUNITY BLOG! “A Thurston County Superior Court judge already ruled that the Grocery Manufacturer’s Association violated Washington State campaign finance laws in its bid to defeat 2013’s GMO-labeling Initiative 522. The court is now considering whether the Association’s illegal conduct was intentional. That determination will have significant bearing on the penalties the organization will pay. If the court rules that Association’s conduct was intentional, the penalties can be tripled. In 2013, the Association raised $14 million from its members in solicitations for a new “Defense of Brands” account, above and beyond regular member dues. PepsiCo, for example, contributed nearly $3 million to the account, and Nestle and Coca-Cola upwards of $2 million each. The Association then donated $11 million of the $14 million to the “No on 522” campaign. As a result, the money was listed as coming from Association, not the actual donors. Read more on this from The Ferguson File. I applaud Washington State Attorney General Bob Ferguson for taking such a strong stand on this issue!